Our comprehensive appraisal for identification or insurance purposes is included, free of charge. There is no GIA report with this one. Most people shopping for a diamond have heard of the 'Four C's". A lot is made of the fourth "C"- Cut - nowadays - and with good cause. The manner in which a diamond is polished really affects how it looks. 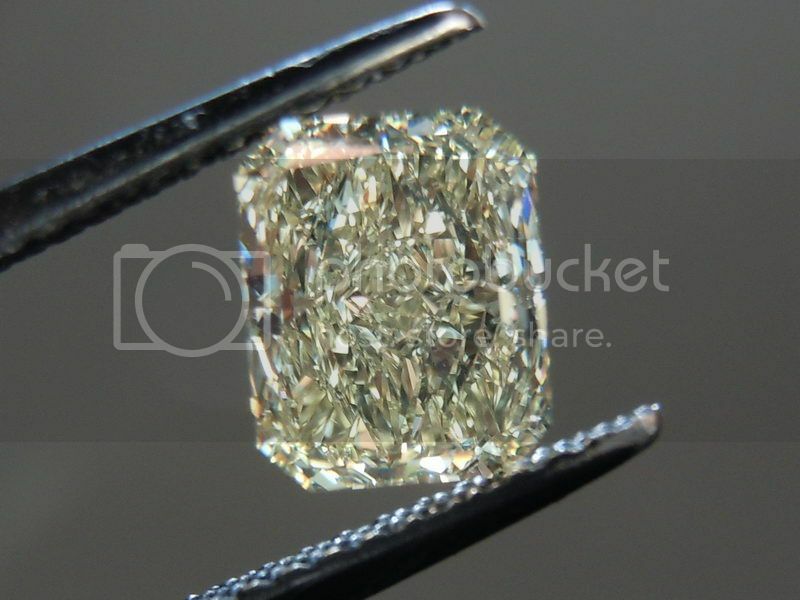 GIA grades the cut of Round Brilliant Diamonds, which certainly simplifies things for buyers. But what about fancy shapes? They are not graded for Cut quality by GIA. Part of the reason is that there is so much variation within each of the shapes, unlike round, which is fairly standardized there is a huge variety of shapes that comprise "radiant cut". Shape - that means LxW and the size of the corners - are only one aspect we need to look at. 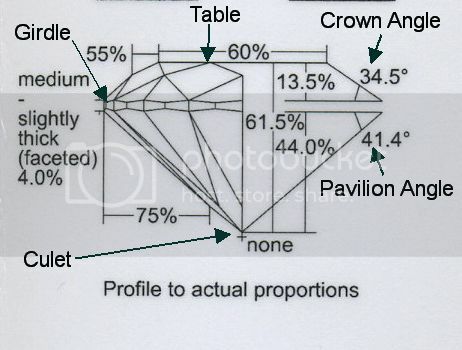 We also need to look at how deep the diamond is, how large the table is ( that's the large flat facet on top) and the crown and pavilion angles. 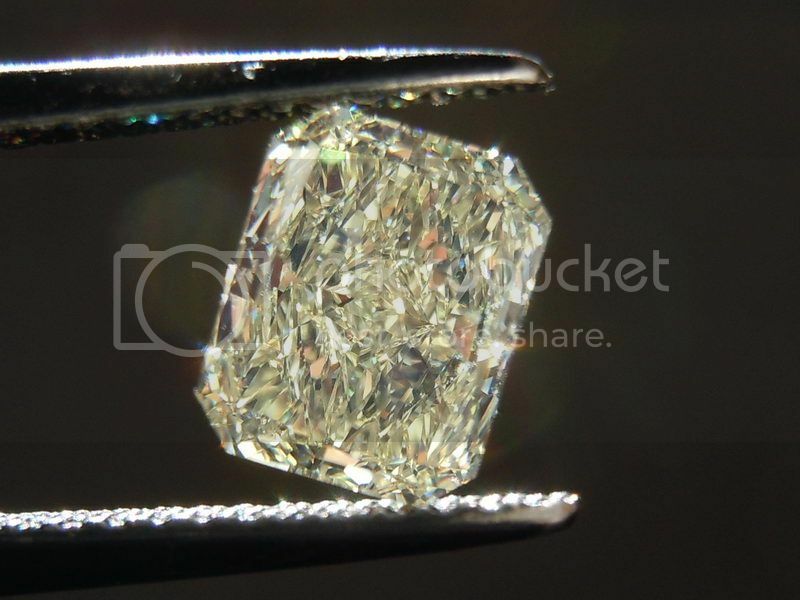 The top of the diamond is the "crown" the bottom is called "pavilion"- separating them is the "girdle"
The point at the bottom is called the "culet"
This stone has a shallow cut. Why would they cut it this way? The reason has to do with the available piece of rough. It might have been a very shallow piece - or this diamond was a piece sawed off the top of an octahedron. The stone they came up with made excellent use of the rough - I am sure they lost a far smaller percentage than the stone I used for comparison. You would expect there to be some penalty visually for this. 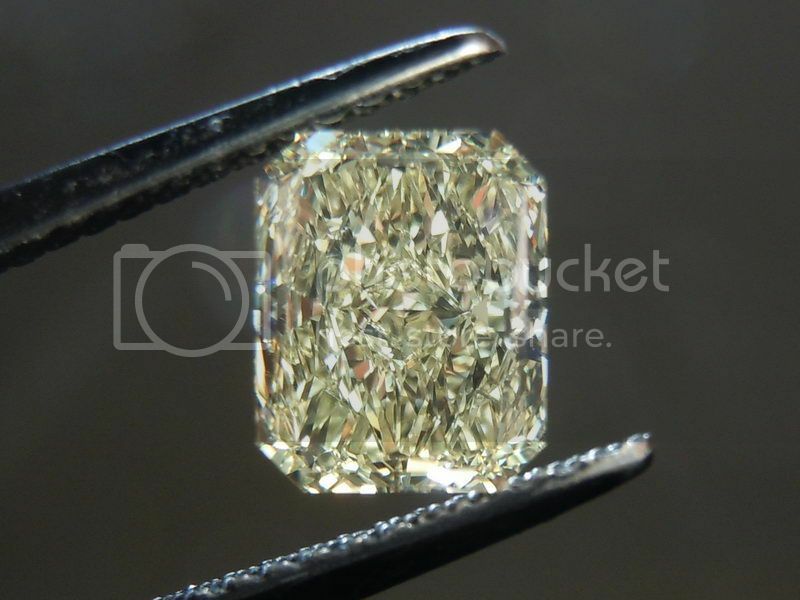 Fancy colored diamonds are really a different animal than colorless and near colorless stones. On many fancy shaped stones, crown height- expressed as a percentage - is sometimes considered. Cuts like our Old Mine Brilliant stones have very tall crowns. This stone has a crown I would estimate to be much shorter than those diamonds. It might be "logical" to assume such a stone would pay a heavy price visually. There certainly is a price for the cut - and it benefits you financially. 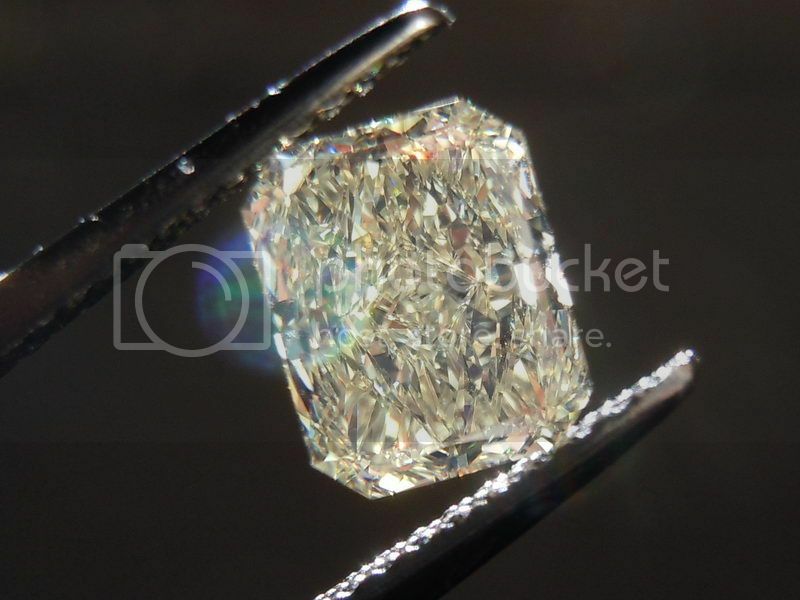 This is a one carat stone, that looks like a carat and a third, yet costs like a 3/4ct. This is a very lively stone with a pleasant light return and fantastic size for it's weight.